Pardon the stupid question, but do you wanna see what it looks like when more than half a million’s floating around a club? Welcome to the Stripper Bowl! ATL’s own QC the Label, which reps Migos and Lil Baby, threw the ultimate send-off Monday night at the Gold Room club for all the exotic dancers who came to town for Super Bowl Weekend. We say the “ultimate” send-off, because they promised a full downpour of $500k … and you gotta see how they delivered. The bash drew a bunch of hip-hop stars — Boosie Badazz, 2 Chainz, T.I. and Tiny, YFN Lucci, Trey Songz … as well as Saints superstar Alvin Kamara. The trophy for best entrance arrival easily goes to Lil Baby, though — chopper for the win! We’re told QC’s Pierre “Pee” Thomas was personally handing out stacks of cash to make it rain on the talent, and in the video you see several bankers boxes full of singles getting ripped open. When it was all said and done, our sources say close to $600,000 was tossed, and you can see it all lining the club floor and bar surfaces. Offset was there too, but as we told you, he’s under a strict “no groupies” ordinance right now … so tough environment, we’re guessing. He and Cardi B hit up another club together earlier in the weekend but, surprisingly, no sign of her at Stripper Bowl. Guess the AVNs are more her style. 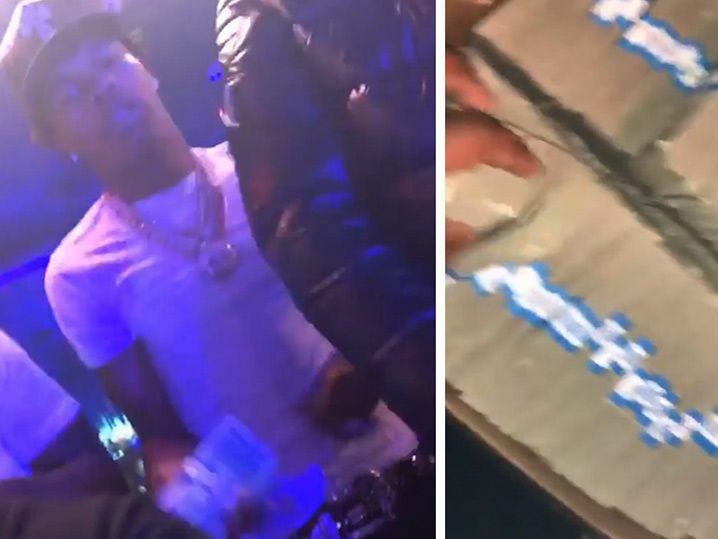 Rick Ross Rages With Patriots Players, Pop That Super Bowl Bubbly!